What is Thumler's MP-1 Rock Tumbler? Thumler's MP-1 is a single barrel rotary rock tumbler. It has a small capacity barrel that is perfect for the beginner or for running small test batches. The small capacity and low purchase price makes it economic for those getting into the hobby. 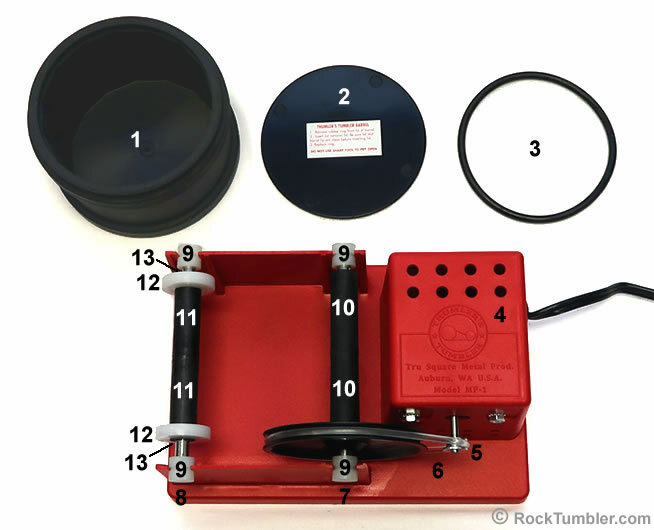 Thumler's MP-1 is sold as a kit that includes the machine, the rough and grit needed to run the first batch, and jewelry findings. Below we will address the most common customer questions about this tumbler. Where Should I Run My MP-1 Tumbler? Operate this tumbler in a location that does not get too hot or too cold. If the tumbler motor gets too hot it will stop. The motor is air cooled so operation in direct sunlight or in a confined space is not recommended. Running a tumbler in below freezing temperatures will cause problems with the water and slurry in the barrel. We have a great article with more considerations when choosing where to operate tumbler. How Full Should the Barrel Be? Whenever you are operating a rotary rock tumbler the barrel should be 2/3 to 3/4 full with material. The MP-1 tumbler's barrel will take about 1 pound of material to get it to the recommended capacity. Check out this video and article to know why the amount of material in the barrel is so important. How Big of Rough Can Be Tumbled? We recommend pieces no larger than 1 1/4 inches for the MP-1 barrel. The height of the usable space in the barrel is a little over 2 1/2 inches. We do not put in material that is larger than 1/2 of the smallest dimension of a barrel. Also, only put a couple of pieces that size in the barrel along with a range of smaller sized pieces. 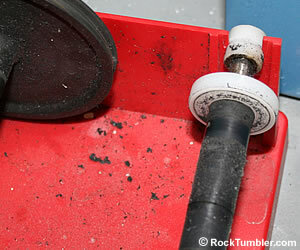 You can learn why this is important in our article about what size rocks to tumble. The bearings on this tumbler need oiled once a month. How Do I Stop My Tumbler From Squeaking? 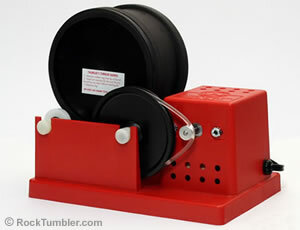 Oiling the bearings on Thumler's MP-1 tumbler will stop the squeaking noise most of the time. Each of the four bearings should be oiled once a month with a drop of oil. If the bearing appears extremely dirty, remove and clean them before adding new oil. Cleaning and oiling the bearings keep the tumbler running smooth and prevent the bearings from squeaking in the future. We have an article on how to oil the tumbler bearings here. Does the MP-1 Motor Need to Be Oiled? No, this motor does not require oil to maintain smooth operation. It is located within the plastic housing on the base which helps protect it from dust and damage. Should the Barrel Rub Against the Guide? Yes, the barrel tends to "walk" to the left or right and the barrel guides are there to keep it on the rollers. It is important to watch which way the barrel "walks". You want the bottom of the barrel facing the barrel guide that barrel is "walking" towards. The next section will explain why. Why is There Rubber Particles on the Base? As mentioned above the barrel will often be rubbing against a barrel guide. As they rub against one another the contact between them will cause the barrel to shed some particles. It is common and should not be cause for concern. The amount removed will reduce as the barrel becomes shaped to ride smoothly against the guide. A new barrel or new barrel guide can cause this to happen. This is why you want to pay attention to which way the barrel "walks". If the lid side is rubbing against the guide, flip the barrel end to end. You do not want the lip that holds the retainer ring in place to get worn down. If it does the lid retainer ring will not hold the lid in place causing the barrel to leak or the lid to pop off. The Motor is Running but the Barrel is Not Turning? A worn belt, slipping belt or stuck bearings can cause this to happen. First check the belt for wear. Check for any flat spots on the belt. We have seen a belt that was rounded on the outside but the inside of the belt, the area that was on the pulleys, was worn flat from continuous slipping. Also check for cracks in the belt. Old belts will start to dry out and lose their flexibility. If you see either of these problems it is time to purchase a new belt. Second, clean the belt and pulleys. Dirt or oil on the belt or pulleys can cause it to slip. With the machine turned off, remove the belt. Use Dawn dishwashing liquid or similar detergent to clean off the pulleys and belt. 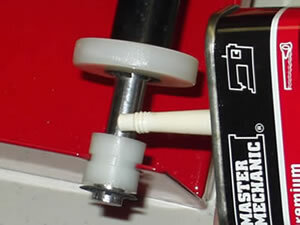 A cotton swab works well to clean the grooves of the pulleys. Thoroughly dry them with a cloth after cleaning. Any soap residue left can allow the belt to continue slipping. Third, you should clean and oil the bearings. Lift the shafts off the base and remove the bearings from them. Clean inside the bearings and the ends of the shaft with Dawn dishwashing detergent. Dry them thoroughly, add a drop or two of fresh oil to the ends of the shafts, and put the bearings back on shafts. 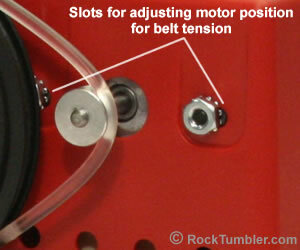 As a last resort you can adjust the tension on the MP-1 tumbler belt. Loosen the motor mount nuts and slide the motor away from the drive shaft. There is not much room for adjusting but it may be enough to keep the belt from slipping. NOTE: If this worked you may want to buy a spare belt to have for the next time. If none of the above steps solved the problem then you will need a new belt. There are many things that can cause the barrel to leak such as a damaged or worn lid, stretched out retainer ring or grit particles on the sealing surfaces. We have an article to help diagnose the possible cause here. 1) Rubber Barrel - The rubber barrel helps with quiet operation and is gentle on the stones. 3) Barrel Retainer Ring - Holds the lid in place to create the watertight seal. 4) Tumbler Motor in Housing - Overload protected motor that will stop if it gets too hot. 6) Tumbler Belt - Turns the drive shaft which turns the barrel. 7) Drive Shaft - Has two shortened rubber rollers, drive pulley and two bearings. This shaft makes the barrel rotate. 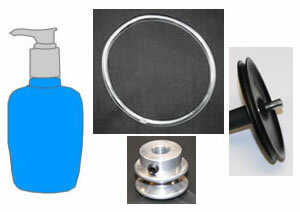 8) Idler Shaft - Has two shortened nylon rollers, two barrel guides, two bearings and two shaft retainer clips. 9) Bearings - Both shafts have a bearing on each end. The bearings hold the shafts on the base. 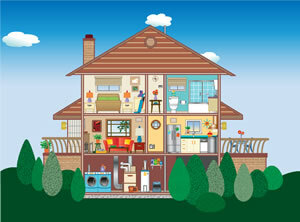 Oil them monthly to maintain smooth and quiet operation. 13) Shaft Retainer Clips - Hold the barrel guides and nylon rollers in place on the idler shaft.